Looking around at the other teaching blogs out there, there’s an awful lot of ranting going on. And fair enough – there’s plenty of valid and worthwhile reasons for ranting, pick a target and go for it. Times tables learned by rote by age 11, would be a topical and popular choice, I suspect. So I obviously need to have a rant. And mine starts with this picture of my youngest son, George. 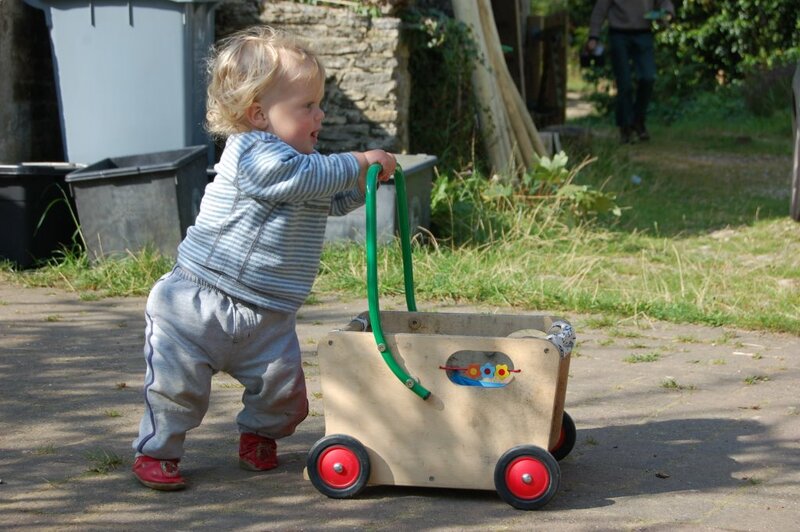 He’s about 12 months in this picture, out in the yard with his cloth nappy and his Jolly Wagon. He’s learning to walk. Learning. To Walk. Learning (to walk). And just Look at him! Now I’m as prepared as any other besotted parent to go slightly funny in the head when one of my children goes through some perfectly normal developmental pathway, but I don’t propose to do that here. I love this picture for reasons that go beyond my slightly less than 50% genetic investment in this chubby waddler. I love it because, and I want to be absolutely clear about this, it shows George LEARNING TO WALK. Learning? But where is the lesson plan? Where is the introduction? The plenary? Why isn’t he taking any notes? How can he learn without some SMART targets and some key performance indicators? There’s no Powerpoint! Hang on, which specific learning outcome are we talking about here? Quick! It’s been ten minutes! We need to assess him! But George gives me hope. Because (look at him), look at how happy he is! Look at how utterly absorbed he is in the joy of the moment and the exhilaration of what he is doing. He exemplifies what I absolutely believe to be true: children love learning. They really do. That’s how their brains are wired, that’s the gift of their genes. They absolutely love learning new things. But they hate being tested. And they hate taking notes. And they hate being the passive recipients of someone else’s information. We’re all complicit. Oh, it starts with the politicians, but everybody now embraces it – the parents, the exam boards, the textbook writers, us…. Improve those grades! Every single INSET/professional development is about how to improve your students’ grades, how to correctly apply the marking criteria developed by the board. The teaching discussion boards are dominated by requests for past exam papers and their mark schemes. Even the students have bought into it, demanding notes because, “that’s the best way I learn.” Really? Really? Anyone here learning to drive? Yes? Taking lots of notes? Anyone got a boyfriend/girlfriend? Yes? Sit around taking lots of notes, do you? Human beings learn by doing. And they love learning by doing. Go on, look at George again. Look at how happy he is! He’s not walking very well, but he’s in control. He’s not taking any notes or looking at a Powerpoint titled, “Early Steps – key stage 1 Walking”. He’s not going to be tested. Indeed, he is blissfully ignorant of the very concept of tests or notes or (long may it last!) Powerpoint. I think lessons can be like this. In fact, I passionately believe that this is what lessons should be like. I’I strongly suspect that I’m in a minority. Someone on Twitter wasn’t very impressed with my Lego Protein idea because the students were having fun, rather than learning. And yet I can’t think of a more false dichotomy. It’s the equivalent of condemning a meal for being tasty, rather than addressing the important issue of providing vital nutrition. Well, not only can meals be tasty AND nutritious, but the BEST meals are both. Same with lessons. The best lessons are fun and everyone learns loads. They learn loads because it’s fun. And challenging. And unexpected. There are teachers who fundamentally don’t get this. Lessons are about delivering information. Homework is about practising past paper questions. Practical work is a bit of optional fun that gets tacked on to the end of a lesson (if there’s time). Yet no learning goes on. And the bright students walk away from Biology at a time when we desperately need them to take it further. We can, we must, do better than this.